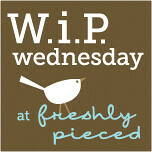 It's WIP Wed at Freshly Pieced! I do this (and love this) because it keeps me focused...keeps me on task! And it gives me a weekly topic to blog about. So the last few weeks I've been digging in my sewing room looking at fabric I forgot I had and working on projects I started many moons ago....and working on them until they are FINISHED. I came across a bucket that had bits and pieces. Some of those bits were the squares in the top I finished last week (That I decided didn't need borders!) and then there were the HST's made from a honey bun of Tula Pink's "Neptune". I was not sure what I had planned for these HST's and not sure what to do with them. Then it dawned on me....so I got to work. Whirlpool is what I'm calling it....and she needs some borders. I'm thinking dark navy and then the coral color in the line. I am in LOVE.....AND with this project I realized something. I now officially am a "real" quilter. I qualify!! whooop whooop! I have been quilting for years. I have made some great quilts and some not so great quilts. I am also learning tons and tons and tons. The first thing I learned is that I sew a mean 1/4" seam but I couldn't cut for beans. I am sure it has something to do with my initial dislike of the iron (I've gotten over it) and my "eh, it's all good" attitude. SOOOO while my seams are great my squares were allll over the map. 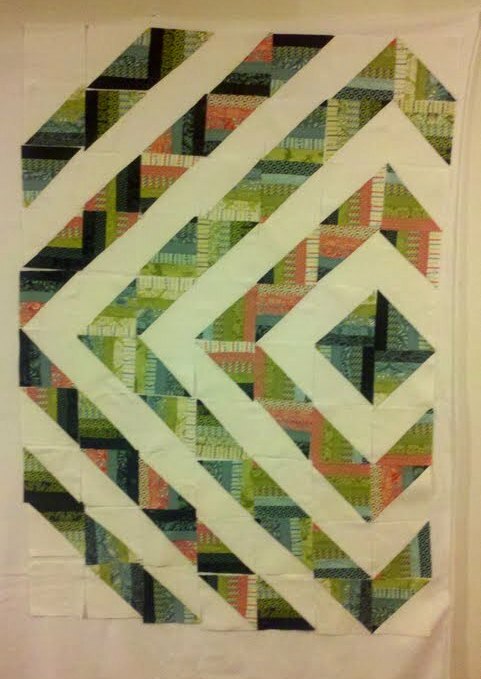 I have spent a LOT of time in the last month truing up blocks made years ago.﻿ All of them have great seams, but they were all crazy wonky (some were so bad...not from this quilt but from another....that I had to trim an entire inch off the blocks). My word for the year therefore was "process". Specifically that I would focus on the PROCESS of quilting rather than the finished product. And WOW....WHAT a DIFFERENCE. Now that I am focusing on the process the finished products are blowing my mind. I have learned to love starch (specifically Faultless Lavender Heavy Starch). I starch my fabric so much it feels like paper when I am done. This helps with the wonky factor. It REALLY helps with bias edges (which I seem to always be running into lately!). I have learned to take my time and press each step as I go. I used to skip pressing until the end. Not anymore. Now the pressing happens between each step. This REALLY changes my accuracy. And lastly....I am taking my time and making sure each step is done correctly before going on to the next step. This may seem REALLY obvious, but it wasn't to me. I never understood why it mattered. And lastly....this is what really took me up a full notch to "real" quilter.....I have a "design" wall. It's a make do design wall, but a design wall none the less!! I took a HUGE piece of white felt I found in my sewing room and stapled it to the wall in the dining room (the only wall in my house that is big enough and bare. My husband is going to kill me when he finds out. He's in Europe this week and welll.....when the cat is away....) and went to work. It works GREAT!!! I looovvvveeee the flexibility of having a "design wall" instead of a "design floor" where the punk can pick up pieces and runnnn like the wind! It's a major change of perspective. Oh well! One step at a time! So after I posted this....a few people have commented and emailed about being a "real" quilter....so I'm adding this big from Ira Glass....that about sums it up! And there you go - you just gave your first 'teacher' class! Spelled out terrifically - you can't skip steps in the process of quilting. And doing those steps correctly - well - makes for a happy camper. Your quilt is beautiful, I love the layout. I'm interested to see your postage stamp quilt. I'm just about to start one! Love the Whirlpool - great idea to mix a jelly roll with a solid for a HST quilt! And the off-centre design is such a great idea! I am so with you on this. I hate cutting fabric, it frightens the bejeesus out of me and so some of my stuff is a bit slapdash. And my seams - sheeeesh! Like you, I decided recently to focus on the process and have fallen head over heels with my 1/4" foot. It makes me want to cut more accurately and the kick I get when my corners all match up - wwell, it's definitely worth it. Good job! 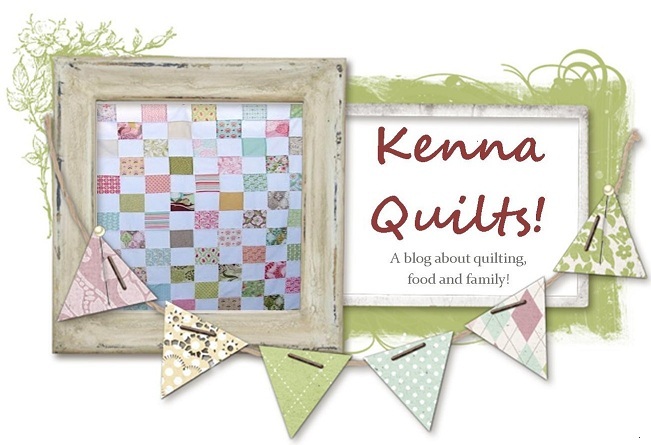 Your quilt is fantastic and how you did the layout. Yes indeed you are a *real* quilter, but I think you have been for a lot longer than what you think :) I LOVE whirlpool, the colors and they way they move are great!! Love it, it looks amazing!! 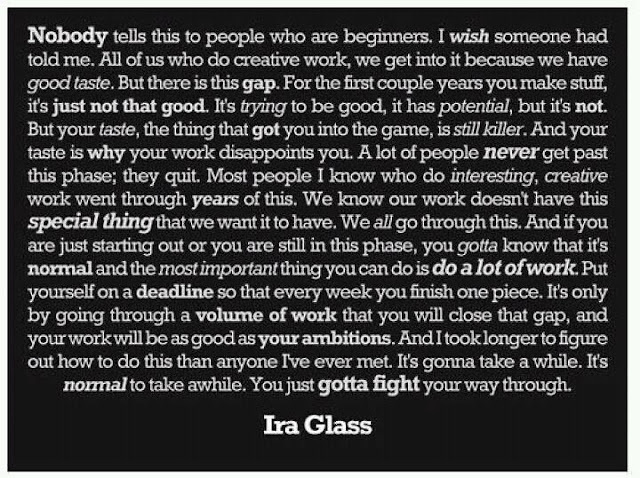 I want to steal your Ira Glass quote, it makes so much sense to me. Plus, I also love your whirlpool quilt. Gorgeous quilt - love Neptune! !